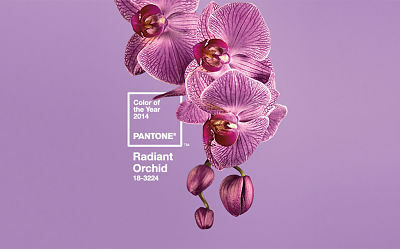 Get Ready for Radiant Orchid…….The color of the year! Pantone, the global authority on color, has revealed it’s color of the year for 2014. Radiant Orchid is a warm, captivating, and engimatic purple. I’m totally onboard!! 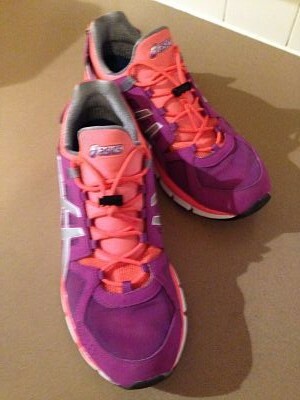 We’ve already started seeing this color in fashion all the way from the red carpet to exercise and fitness. 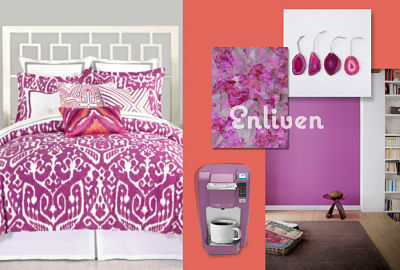 Radiant Orchid is influencing interiors as well. You can incorporate this jazzy, joyful color to interior spaces through paint, accent pieces, bedding, and accessories. Radiant orchid complements hunter and olive greens, and offers a stunning combination when teamed with Melon, turquoise, teal and light yellow. It also livens up our go to neutrals including gray, taupe, and beige. Bold and uplifting, yet not overpowering, Radiant Orchid energizes almost any color palette with a punchy yet soothing touch of warmth. If you’re wondering how can there be just one color of the year, and who determines this? Well, here is a little more information you may find interesting. The color of the year selection requires careful consideration by The Pantone Color Institute. They comb the world looking for color influences. This can include the entertainment industry, traveling art collections, hot new artists, popular travel destinations and other socio-economic conditions. Influences can also come from technology and even upcoming sporting events that capture worldwide attention. I’m excited to see where this jazzy color continues to show up this year!